Shinn Asuka (シン・アスカ Shin Asuka?) is a fictional character from the anime series Mobile Suit Gundam SEED Destiny. 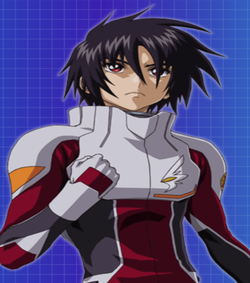 Although he is main protagonist of the first half of the series, he constantly sides with the antagonists of the series, as he is unaware of their true motives, which eventually causes him to becomes an enemy to the returning protagonists from the original Mobile Suit Gundam SEED, and thus he serves as the anti-hero of the series as well. 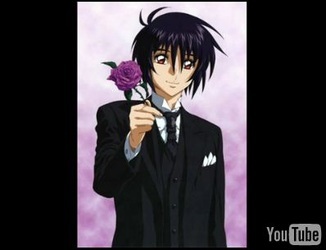 Witnessing his family's death right before his eyes has had a traumatic effect on Shinn's life. However, during flashbacks of his past he was shown to be a very cheerful person, showing how much he changes through this tragedy. He is impulsive, stubborn, hot tempered, and sometimes arrogant even to his superior officers. Shinn has also shown to act own his feelings, this sometimes put him in odds with his superior officers. His family's death has also left him with anger against his homeland of Orb and the rulers of Orb, the Atthas though he still seems to have some faith in Orb. The tragedy has also left Shinn with deep hatred for war and the ones who cause war giving him a determination to end conflict to prevent tragedies like his from happening again. Despite this, Shinn has shown to be a very kind and gentle person mainly to his two love interests in the series Lunamaria Hawke and Stella Loussier both of whom he is very protective of. He still deeply saddened by the world's cruel actions and all the people that have died in his life; despite his conflicted emotions, he fights for wanting to change the world for the better.